In the electronic age, ignorance is a choice. Reddit is a subsidiary of Condé Nast’s parent company, Advance Publications, a privately held Jewish-American media company owned by the descendants of S.I. Newhouse Sr., Donald Newhouse and S.I. Newhouse Jr. They have a financial, political, and Zionist interests in promoting and defending the US Government’s official 9/11 conspiracy theory of “19 bad guys with box cutters”. Light-wave energy in the same spectrum of energy found in home appliances may soon be used in a new generation of weapons. On Thursday, the Laboratory’s Associate Director for Threat Reduction, Douglas Beason, will talk about America’s new directed energy weapons in a talk at the Laboratory’s Bradbury Science Museum. The talk is scheduled to begin at 6:30 p.m., and is free and open to the public. After the talk, Beason is scheduled to sign copies of his new book, “The E-Bomb: How America’s New Directed Energy Weapons will Change the Way Future Wars will be Fought,” at the Otowi Station Bookstore next to the museum. Beason, who was named Los Alamos’ Threat Reduction Directorate (ADTR) leader in January, is a leading expert in directed energy research. At the talk, he will describe the development of a new generation of weapons that discharge light-wave energy. The technology that supplies the same spectrum of energy found in microwave ovens or television remote control devices is a revolution in weaponry, perhaps more profound than the atomic bomb. Beason will discuss these new weapons and answer the questions that everyone is asking: What is directed energy? How do these new weapons work? How lethal are they? According to Beason, the first directed energy weapons are being tested now and their deployment is being planned for today’s battlefields. In science fiction, futuristic soldiers are often shown wielding light emitting weapons – Flash Gordon’s ray gun, Captain Kirk’s phaser, and Darth Vader’s light saber. Today, this imagined future of science fiction is on the road to reality. After more than two decades of research, the United States is on the verge of deploying a new generation of weapons that discharge light-wave energy, the same spectrum of energy found in your microwave or in your TV remote control. They’re called “directed-energy weapons” – lasers, high-powered microwaves, and particle beams – and they signal a revolution in weaponry, perhaps, more profound than the atomic bomb. Those who control the energy control the people. But those who control their perception control everything. The oil industry (leaded gas), tobacco industry (lung cancer), and more recently the NFL (chronic traumatic encephalopathy), have all spent millions and millions of dollars marginalizing scientific findings and the scientists that find them by way of “public relations” which is another word for propaganda. Lead in the food chain, carcinogens in the air, and brain damaged football players are all good for you, right? 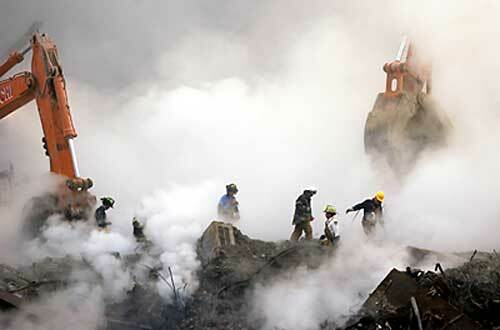 The mass of each WTC tower was around 500,000 tons or 1,102,311,310.9 pounds. Garbage trucks weigh around 33,000 pounds empty. The destruction of each tower would equal the sound of 33,403 empty garbage trucks raining down. (a little over one quarter of all U.S. garbage trucks in service) That didn’t happen. 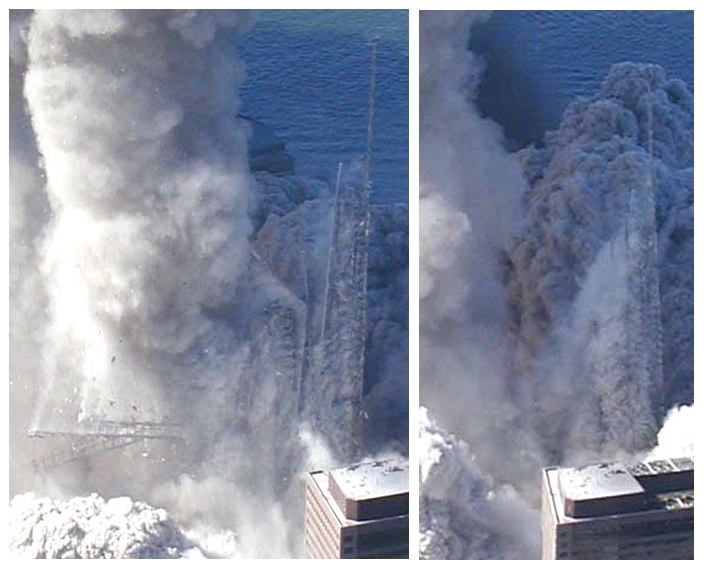 The towers were turned into dust in mid air never hitting the ground. Figures don’t lie, but liars figure. High heat is part of the government’s official conspiracy theory and is as relevant as “19 bad guys with box cutters”. Using water and dirt to quench cold molecular disassociation is not evidence of high heat. High heat? Why hasn’t the steam cooked these workmen alive? Why are the pressurized hydraulic hoses on the heavy equipment still working and not bursting under high heat? Why is wet dirt fuming? Steam? If this were steam, these workers would have been cooked. If this were as hot as a grill, these people would become something that looked more like a grilled-cheese sandwich. The hoses to their torches would melt and ignite the fuel. 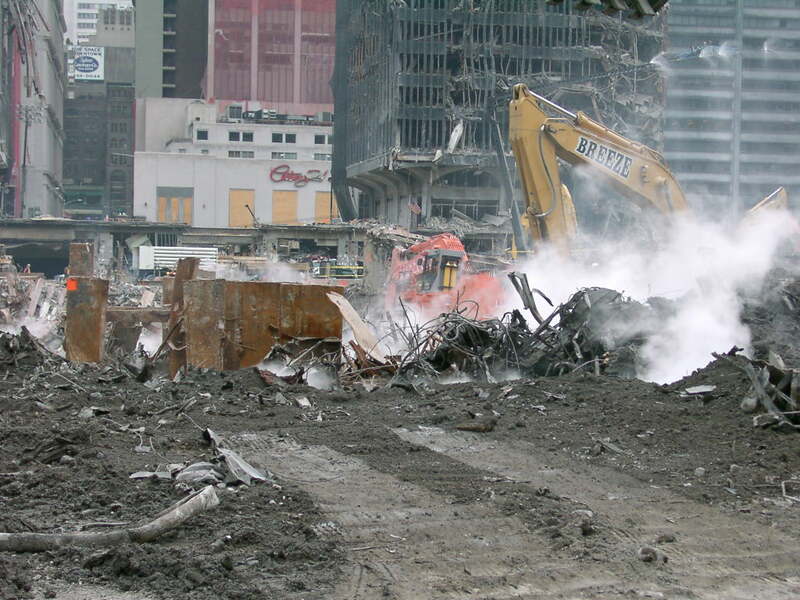 On September 27, 2001, the four yellow dump trucks are heading south on West Street, toward the WTC complex. Each of the dump trucks carries a uniform load of what appears to be dirt. 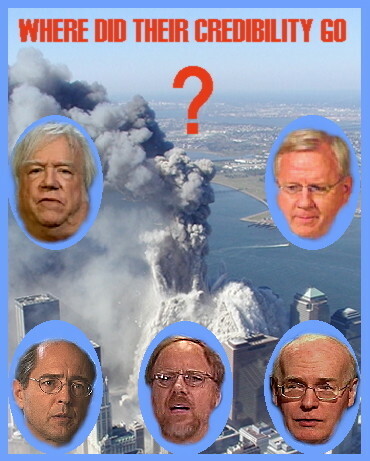 WHY WOULD THE DIRECTED ENERGY COVER-UP TEAM WANT 9/11 JUSTICE FOR ALL? A fallacy is an error in reasoning. This differs from a factual error, which is simply being wrong about the facts. To be more specific, a fallacy is an “argument” in which the premises given for the conclusion do not provide the needed degree of support. Decredentializing a highly qualified expert like Dr. Wood by appealing to spite, ridicule, or willful ignorance does nothing to support a valid argument. 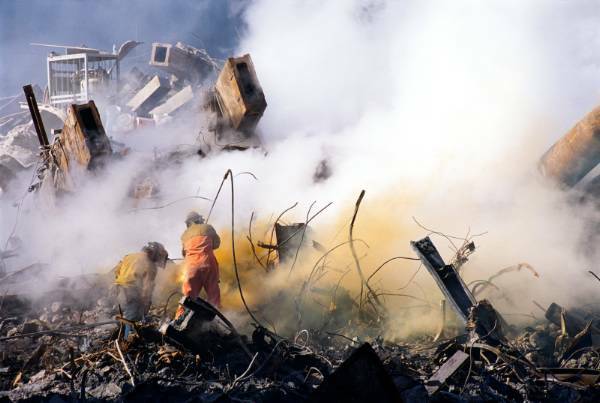 Also, an opinion and an Internet connection does not qualify someone as an expert in forensic engineering and science, nor nuclear physics, nor structural engineering, nor materials engineering science, nor engineering mechanics (applied physics). The empirical research Dr. Wood performed is a way of gaining knowledge by means of direct and indirect observation or experience, not by performing experiments. Steven Jones [Journal Of Nine Eleven Studies or J.O.N.E.S.] and Greg Jenkins used to ridicule Dr. Wood by claiming that it would take more than five times the world’s energy to destroy the WTC towers. 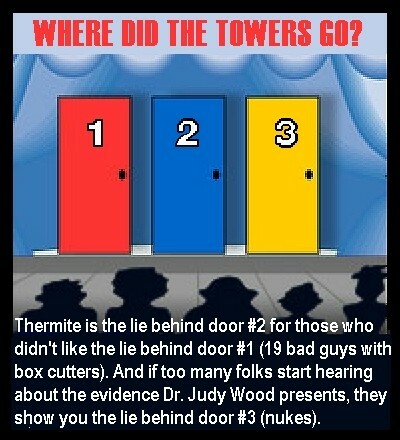 Does that mean their thermite came from off planet or “outer space”? LOL What experiments would Dr. Wood perform? What are the experiments for, to prove the buildings are still there or if the buildings are gone? Why not just look? No assumptions needed with empirical evidence! A forensic scientific investigation involves the collection and analysis of ALL of the evidence. Even though A&E911truth appeals to authority and popularity, a controlled group is not synonymous with evidence.